Smartphones with glass backs are becoming popular as OEMs have lately started focusing more on CMF (colour material and finish) to differentiate their offerings in the crowded smartphone market. 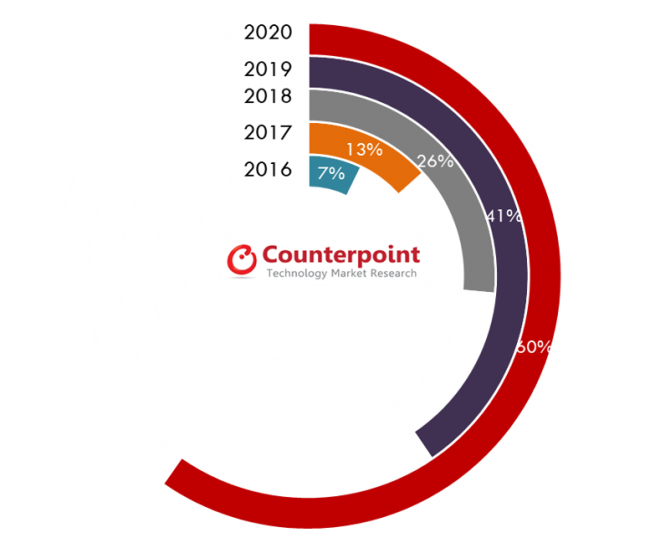 As per Counterpoint Research’s latest estimates, the overall penetration for smartphones with glass backs will reach 26% of total smartphone shipments by the end of 2018 and possibly 60% by the end of CY 2020. Smartphones with glass backs have already penetrated the premium segment (80%). Almost all the premium smartphones launched in CY 2018 came with a glass back and the trend is likely to stay for rest of the 2018 and beyond. One of the reasons for glass becoming a preferred choice over metal is the overall look and feel of the device. With average smartphone prices within the premium segment going up, smartphones with glass backs add to the overall look and feel, making them look more attractive and premium. Another reason in favor of glass backs is the increasing adoption of wireless charging. Metals don’t support wireless charging as effectively as a glass back does. However, the adoption of wireless charging is relatively low, with Samsung and Apple driving adoption. As more smartphone makers start including Qi technology, the adoption of wireless charging is set to increase and can penetrate the mid-tier segments. In addition to the above, the decision to go with glass backs for an OEM also reduces the BoM cost as glass sourced in a larger quantity will be cheaper than an all metal build. From a connectivity standpoint as well, glass doesn’t interfere with radio waves and allows them to pass through easily and hence ensures strong signals for LTE/WiFI/Bluetooth. 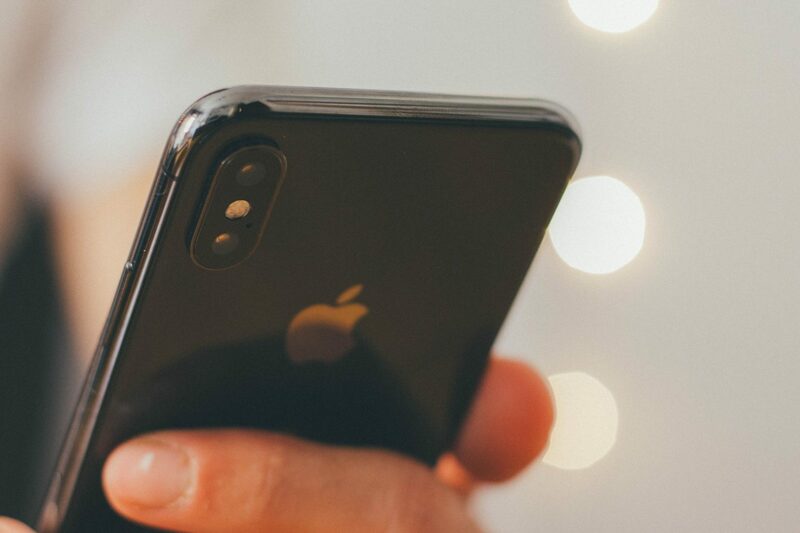 Apple was the only OEM having almost 64% of its portfolio with a glass back. This was driven by the iPhone 8 series and iPhone X.
Samsung which started adopting glass backs much earlier than other OEMs, with its S6 series, is also driving the trend with 36% of its overall smartphone shipments sporting glass backs. This will go up to 50% by the end of CY 2019. Additionally, in the mid end segment its A series has now completely adopted glass backs and metal casing. Within Chinese brands, Huawei has been driving the trend even within the $200 segment through its Honor series. We estimate that glass back adoption within the Honor Portfolio will be faster than the rest of the Chinese OEMs. Xiaomi took a different route, using a ceramic back in its Mix series. Due to challenges in generating mass for the material, it has started adopting glass backs. Vivo and OPPO have started adopting glass backs in their flagships F9 and V11 series during 2H 2018. Penetration of glass backs for key Chinese players like OPPO, Vivo and Xiaomi will reach one third of their overall smartphone shipments by the end of CY 2019. In terms of price band, Smartphones with glass backs have started to penetrate the mid-tier segment towards the end of 1H 2018, driven by brands like Samsung, Huawei and Xiaomi. However, only 1% of the smartphones in the sub $150 segment have glass backs while only one-fifth of the smartphones within the $400 segment have glass backs with metal casing. Going forward, almost all the smartphones in the premium segment (>$400) are likely to sport glass backs. The adoption of glass backs is likely to accelerate in the coming quarters driven by OEMs like Apple, Samsung, Huawei, Xiaomi. This is a positive development for companies like Corning which is likely to cash in on the trend. For our detailed report on smartphones with glass back penetration, visit our Insights Portal. Tarun is an Associate Director with Counterpoint Technology Market Research, based out of Gurgaon (near New Delhi). Tarun has 8 years of work experience with a key focus on the evolving mobile device ecosystem with specialties in Emerging Markets. He understands specific mobile industry nuances, helping clients to navigate through the rapidly changing technological trends. As a Telecom Analyst he has been quoted extensively by the leading media platforms. Tarun holds a Post Graduate Diploma in Management, specializing in International Business from the Amity International Business School and is a graduate in Physical Sciences from Jammu University, Jammu in the northern Indian state of Jammu & Kashmir.